Beautiful Kosrae (pronounced Kosh-rye) is one of the island States of the Federated States of Micronesia, just a delightful boat ride north of the Equator. The second largest island, Kosrae is a paradise for divers and adventurers alike, with the most beautiful white beaches in Micronesia. Kosrae, called “The Sleeping Lady” because of the shape of one of its picturesque mountains is covered with dense tropical jungles and high volcanic peaks, with lush river valleys and spectacular views. The island is surrounded by very healthy fringing reefs teeming with splendidly colorful tropical fish feeding off the spectacular corals. Visibility often exceeds 30 meters (100') — perfect for spotting paddling sea turtles and large rays winging their way through the blue waters. 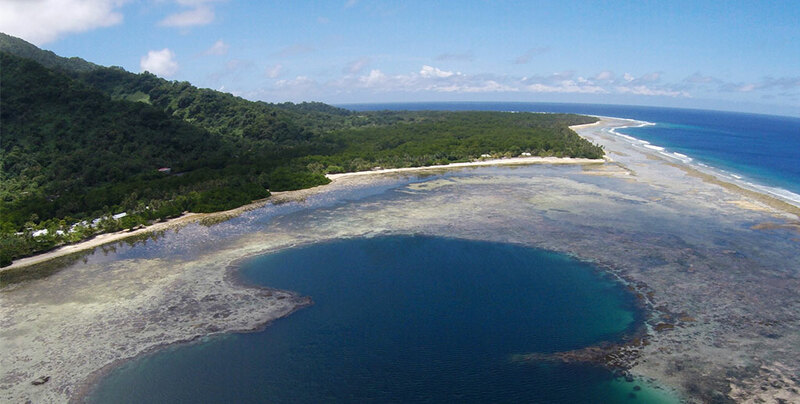 The coral reefs, which slope steeply into the clear blue depths, are one of the great attractions of Kosrae. Equally attractive are its warm-hearted people. Visitors leave here with vivid memories and a yearning to return. 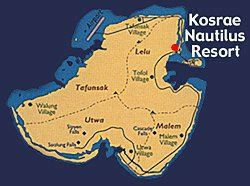 Click on the link below to read what Australia's largest dive magazine had to say about Kosrae and Nautilus Resort in their Feb/March 2008 issue. Kosrae is the second largest and eastern most island in the Federated States of Micronesia. 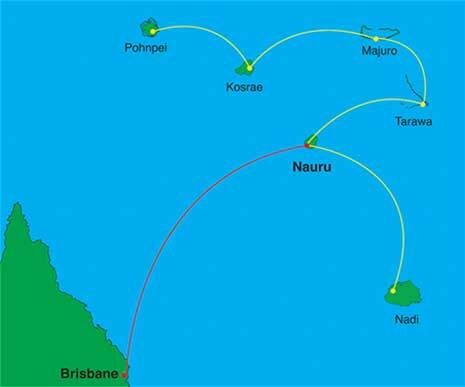 Lying 5.2 degrees north latitude and 163 degrees east longitude, it is north of the Solomon Islands and halfway between Hawaii and Guam. Kosrae is a single island state of 42 sq. miles and is one of the most beautiful islands in the Pacific. 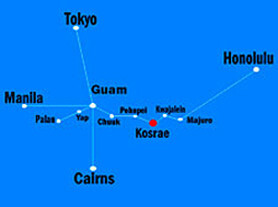 Kosrae is in the same time zone as the Solomon Islands or New Caledonia, Greenwich Mean Time plus 11 hours. United Airlines services Kosrae with two east and west bound flights per week from Honolulu and Guam, which makes Kosrae easily accessible even for short vacations. 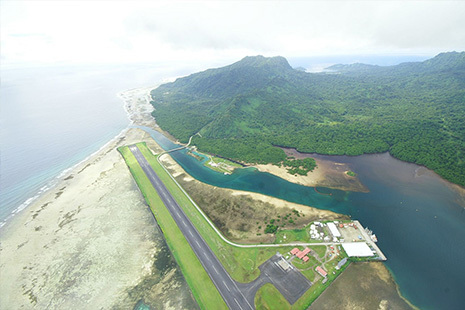 When doing a flight search, Kosrae's airport code is KSA. The Kosrae International Airport, in Tafunsak Village is located at the north-western corner of Kosrae, and is only 15 minute drive from our hotel. When you arrive at the airport in Kosrae, our staff will be waiting for you. Return trips to the airport from the resort are scheduled daily for the outbound flight. Airport transfers are free of charge. Kosraean is the local language and the older citizens still speak Japanese, but most of the people also speak good English. The average day time temperature is 28 to 30 degrees Celsius (82 to 86 degrees Fahrenheit), and at night it only drops to 26 degrees Celsius (80 degrees Fahrenheit). Humidity is usually high, so air-conditioning is available in all of our guest rooms and restaurant, or you can enjoy outdoor dining with ceiling fans outside by the swimming pool. The trade winds blow between November and May with an average annual rainfall of approximately 180 inches in the mountains. There is no particular rainy season, but overnight rainfall of an inch is common. Several stores on the island offer a variety of goods, along with one large supermarket. Hotel gift shops offer locally made handicrafts and souvenir T-shirts. The Visitor's Bureau also offers souvenirs. MasterCard, Visa and Travelers Checks are accepted by Kosrae Nautilus Resort & some other hotels. Car rental and smaller businesses do not accept credit cards. Local artisans sell handicrafts from their homes and workshops and in small general stores. Taxis and rental cars can be arranged once you arrive at the resort. If you like, we can have a rental car waiting at the airport or hotel for you. If you arrange a rental car through us you can also make payment for it to us with your credit card. There is one post office on Kosrae. Postal rates are similar to those within the United States. The post office is open Monday-Friday, 8.30 a.m. to 3:00 p.m., Saturday 11.30 a.m. to 3:00 p.m., and is closed Sundays and on FSM holidays. Courier service is available for express mail to destinations in the U.S., and elsewhere throughout the world. Kosrae is linked to the rest of the world by way of satellite and fiber optics. A full range of telecommunication services, including pre-paid telephone cards, internet, and facsimile machines are available to all points overseas. The telephone country code is 691. Our resort has wireless internet, so if you bring your laptop, you can connect in your room, by the swimming pool, at the beach front gazebo, or under one of our thatched huts with a swinging chair. The Wi-Fi is free in our lobby, or accessible by prepaid card from your guest room. If you don't bring your own computer, you can visit FSM Telecom's office in Tofol from 8 am to midnight & connect to the internet on their computers with a pre-paid card at .08 cents/Mb ($5.00 minimum). Kosrae uses United States currency. There are two commercial banks, the Bank of the FSM and the Bank of Guam (hours 9:00 am to 3:00 pm Monday to Friday). Both banks have an ATM. Only a few places, including our resort accept credit cards. Standard 110 volts and US outlets. Since Kosrae is 400 miles north of the equator, the sun's rays are very strong. You should plan on using sun screen and limiting sunbathing. Bring a long sleeve rash shirt if you plan on snorkeling. We have 26 channels of cable TV including CNN and BBC to catch up on the world news, along with the Discovery Channel. You should plan on dressing in a casual but conservative manner, both for protection from the sun and so as not to offend the local people. Light summer clothing is always appropriate. Throughout the Pacific it is considered immodest to reveal the upper leg. Men and women should wear long shorts (Bermuda length), skirts or lava lava's while in the villages or in public areas such as restaurants. Dress is more relaxed at our resort. When attending Sunday church services, men should wear long pants and a shirt with a collar. Women should keep in mind that modesty of attire is preferable. A skirt or dress would be more appropriate than slacks, and a top with at least a short sleeve. The majority of people on Kosrae are Congregationalists, but there are other denominations represented as well, including Seventh-Day Adventists, Church of Jesus Christ of Latter Day Saints, Catholics, Baptists, Pentecostal, and Assembly of God. All hold regular services, visitors are welcome to attend the church of their choice. Kosrae has a Police Department and Hospital. For the reader, the Rose Mackwelung Library may be of interest. The library, located on the Kosrae High School campus in Tofol, it offers a fine collection of images of Micronesia, and its Pacific Island collection contains many Micronesian reference works. The Reference section has many government documents. 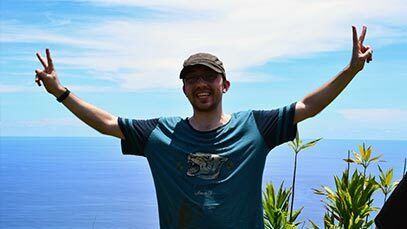 Hours are Monday - Friday, 8:00 a.m. - 1:30 p.m.
Josh is bringing a new enthusiasm and excitement to Kosrae, with a vision to see Kosrae Nautilus Resort become evermore recognized and traveled to so everyone can enjoy one of the most beautiful, scenic and remote islands in the world. Friendly smiles at every turn. Somewhere that no one you know has visited. Lush green landscape where ever you look. A relaxing pace (plenty much time later, as they say here). Fresh fruit just picked from the tree. 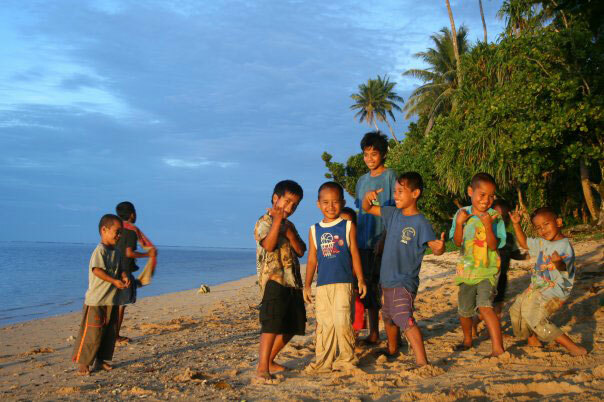 By the way, Frommer's travel guides named Kosrae as one of their top destinations in the world to visit in 2008. Entry requirements for Kosrae are similar to U.S. destination, but a U.S. Visa is not required; however, a passport and onward ticket are required. People from most countries can enter as a visitor for 30 days, with extensions up to 90 days available with application after arrival. A US$ 15 departure tax in cash is collected at the airport before departure. Ticket reservations can be made locally through United Airlines, located at the airport, or any United Airlines office around the world. Customs checks are performed upon entry to Kosrae. Visitors are allowed to bring one carton of cigarettes, one pound of tobacco (about 20 cigars), and 52 fluid ounces of distilled spirits. An import tax for excess tobacco and alcohol products will be levied. Under US$200 of the following: cosmetics, toiletries, perfumes, nonalcoholic beverages, foodstuff are permitted entry with no tax. Fruit, vegetables, flowers, and other plant life, as well as livestock, poultry, and meat products are either prohibited or restricted. Prescribed medicines containing habit-forming or other controlled drugs and narcotics should be accompanied by a prescription or written statement from a physician. Prescriptions should indicate that the medicine is used under a doctor's supervision and is necessary for the traveler's physical well-being.